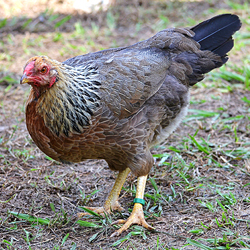 This is the uber chicken: autosexing, beautiful, friendly, and it lays gorgeous jumbo eggs! If you buy just one breed, this is it. The Deathlayer is a very proficient layer and with its tight cushion comb, iridescent greens and purples in its black feathers, luxuriant tail, and totally black doll eyes it can easily compete among the most beautiful chickens on the planet. This elegant German breed lays tons of eggs. Its compact, athletic body lends itself well to free-ranging. 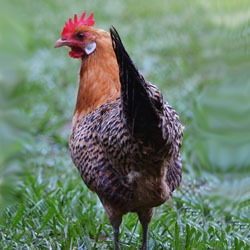 This fierce looking Dutch breed has a gentle disposition and lays tons of tinted eggs. Their upright station and muscular physique make them excellent free-rangers that are vigilant against predators, yet they are as gentle and people-oriented as dogs. 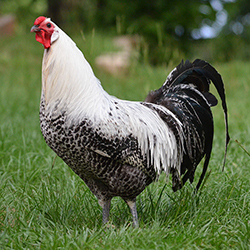 Our favorite free-range pet on the farm is a Twentse rooster name Claude. A gentle and beautiful German breed. Rare and dual purposed, they can be penned or free-ranged.